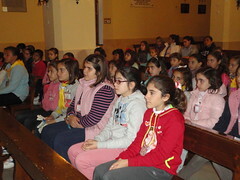 On November 16th and 23rd, we had get-togethers for girls at the Shrine of Our Lady of the Águila in Alcalá de Guadaíra, Seville. 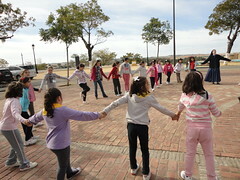 Between the two days there were 90 girls who came to participate in this wonderful activity. What did we do? I would say, "Come and see," but so that you get excited enough to come, I am going to tell you. 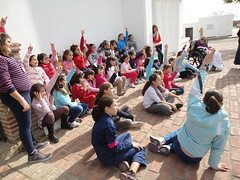 As soon as we arrived, we sang some songs with hand-motions to shake off the cold and fill our hearts with joy. Then, we went to our beautiful Shrine presided by the King of Kings, Our Lord, in the Tabernacle and by the Queen, Our Mother, the Virgin of the "Águila". There we prayed the Angelus, practiced a song and listened to points of meditation about how sin is a leperous disease, using the passage of Sacred Scripture that talks about the ten lepers who were cured by Jesus. Five minutes of silence so that each girl could talk with the Lord and ask Him to cure her of this leprosy, a song to Our Lady, and all hands to the dough. That's right, just as you're reading it. Hands to the dough, because in both of these get-togethers we learned to make waffles... some very delicious waffles. 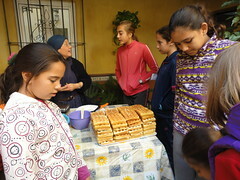 Using portable tables, at the door of the Shrine, it was fun to see the enthusiastic faces of the girls as they poured the flour, the sugar, and the eggs into bowls. We rolled up our sleeves to our elbows, to mix the dough well, because that's the key to success. Once the waffle-makers were turned on, all our noses were pointed in that same direction, and our eyes were fixed on the first waffles...that were devoured as soon as they came out. Outside, games that involved running, charades... and after this, and with a big appetite, each one went to get her sandwich from her backpack. We blessed the food, and went to eat in groups around the shrine. After lunch, we divided inro two groups, older girls on one side with a sister and little girls on another side with another sister, for a formational meeting. The topic: "How to prepare yourself for a good confession". These girls think! There were many interesting questions and comments. Blessed be God! Later they were able to put it into practice because a priest came to hear confessions. And to finish off the day, we had arts and crafts. What did we make this time? 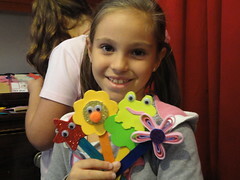 Some beautiful bookmarks. We had to race to finish all four types. We had to cut at high-speed, covering ourselves in metallic paint, maybe a slight burn with the hot-glue gun and, at last, the joy of being able to take home our self-made, useful project. The dreaded hour came, 5 o'clock p.m. The square began filling up with the parents' cars, coming to pick up their girls who had enormous smiles on their faces for the day's experiences and with a plate of waffles that they are desiring to share with their family. Until next time! I don't know what you are waiting for to participate in this activity. If you would like to leave with your heart full of God and have a great time, these get-togethers are for you. Can't wait to see you there! -Servant Sisters of Alcalá de Guadaíra, Seville (Spain).